Hey, sweetheart, when I say “bring me a cup of coffee,” I mean bring me fresh coffee, OK? Bloggers: It is once again National Offend A Feminist Week. Your expressions of reactionary, oppressive, patriarchal, misogynistic traditionalism are solicited. Search your mind, search the Internet, and come up with a post guaranteed to make Jessica Valenti even angrier than usual. Please link here for inclusion in a special honor roll listing next weekend. Extra credit for women who find some way to enthusiastically embrace their traditional femininity. Now hurry up with that coffee, sweetheart. And make sure it’s fresh this time . . . Some of these are pretty funny (USCitizen’s “So, you’re a feminist; well isn’t that cute? ), but mostly they lack in creativity. Y’all are welcome to mine our site for things feminists are offended by. So I kept putting off posting something about Robert Stacy McCain’s annual National Offend a Feminist Week until I woke up this morning and realized it’s almost over. In fact, today is the last day to get in on the fun…. I’m working my heart out for this Celebration! Here’s my effort minted fresh this morning. 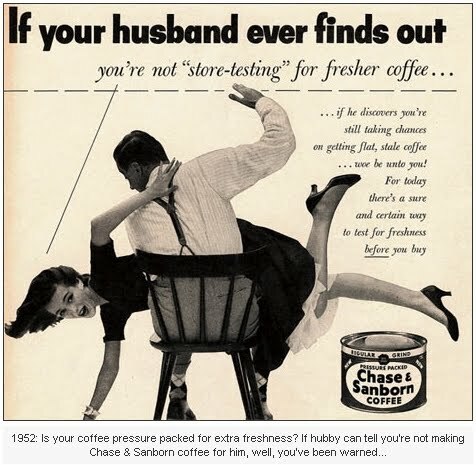 No reprinting of tired old retro ads for me. How to offend a feminist? Hmmm, how about: Why are your earmuffs in your armpit? Or: Wow, you have alpacca stockings on! Or you could just remind them they were useless in science and math, felt maligned by men in high school because they were dowdy and had bad personalities, and that they secretly wished they were men. So they adopted a self-validating falsehood and tried to turn it into a serious field of study. As we all know, “Women’s Studies” ranks right up there for intellectual validity with sociology, political science, English lit and the other pursuits of the intellectually deficient or lazy. Q. Why do feminists have periods? Bit late I guess, but maybe you can use this for next year. A guy goes into an express elevator, and a woman scoots in just before the door closes.